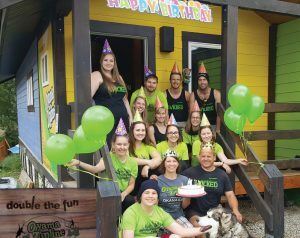 One of Okanagan’s busiest attraction has opened the gates and invited the public to tour and help celebrate their 7th anniversary June 24. Those who take the scenic drive can stop at Oyama Zipline Adventure Park to view the vast network of environmentally-friendly construction completed in the trees since 2011. There will be lunch and cake and family activities all day. Peter and Jennifer Madsen are understandably proud of what they have built, and will be celebrating with staff, family and the community. “We are the only full-size aerial ropes courses and zip line park in B.C.”, states Peter, “and we keep bringing new experiences – try the rope maze or human football free on Sunday”. The birthday party is a good opportunity to take a peak at the operation; and get good value for the dollar if you choose to “harness up” for the high ropes. The adventure attraction can draw over 100 people he mountain during summer months. This Sunday, adults and children will be able to view Monkey Play Park and try the outdoor games in the entrance area no charge. Jennifer explains that the entry level price ($15) allows kids as young as 3 years old to zipline. The Monkey Play Park supervisors interact with children during the 2 hour activity. They have planned face painting and new games for the birthday party. “We hope this event will inspire more families to come to the forest, especially for birthdays”. It seems there is new following that has people heading for the trees. Some think connecting with nature or taking a thrill ride is reason enough to head to an outdoor park. A new trend claims “forest walkers” of all ages gain benefits from simply being near trees. People who advocate for Forest Therapy, such as Ben Page of USC, urges participants to “slow down, turn their mind off, awaken the senses” – prompting them to be in their body… which he claims relaxes the mind. Robert Locke, a freelance writer, explains the benefits this way, “…children playing in these forest environments are better at many cognitive skills but also have better manual dexterity and can assess risks better than those kids educated in an enclosed space.” This kind of outdoor experience encourages visitors to deepen their appreciation for forests. The Madsens hope the guests will be influenced to help protect forests and help the planet. Because the park has expanded, the recreation choices for youth and adults have never been more diverse. This weekend during the birthday party; 2011 prices and chances to win free tickets are available. See www.oyamazipline.com for more information. PreviousPrevious post:Congratulations Holger NierfeldNextNext post:Over 40 guests attended our June Business After Hours!